This is going to be a review of Brain Fire’s Focus and Memory Support supplement. The company states this product is meant to aid and help improve your focus and memory recall. The ingredients in this product are meant to increase your blood flow and help improve your circulation to promote healthy cognitive function. If you are interested in whether or not this product will help you and meet your cognitive needs keep on reading to find out more. DMAE Bitortrate, which is meant to aid in the prevention of oxidation of your brain’s neurons. Bacopin is reported to help with cognitive function. Phosphatidylserind, which helps to fight the decline of mental function due to age. Ginko Biloba is said to help increase the body’s blood flow. There is no information listed as to what the recommended dosage is for the product. As with any new supplement, it is highly recommended you first consult with your doctor with any questions or concerns you may have about the product. Also, women who are pregnant or nursing, those who are currently taking a prescription medication, or those who have an existing condition should always first speak with their doctor before taking any type of supplement. It seems this website wants to bait potential customers with its “discounted price.” When you click on the “Place Your Order” option, you are sent to a new page with a product, by a different name. The company then asks you to fill out your information before you can even see the “discounted price.” They also state this product is only available until midnight. It seems to us this to lure new customers which is not appealing or in the best interest of new customers. On the disclaimer page of the company’s website, the company states a similar product will be listed if Brain Fire’s Focus and Memory Support is unavailable, which seems deceptive since the customer initially wanted to try this particular product. We could not find any information on the homepage about a guarantee. With a company that has so many claims about how well this product does, it is odd it does not have a guarantee or any information about a return policy listed anywhere. There are no reviews listed for this product. We could not find any conclusive information to support this product does what it claims. While Brain Fire’s Focus and Memory Support may seem like a promising product, there are a lot of flaws present. The company’s page itself is very bare bones and if a customer wishes to order the product, they are taken to a separate page which claims to be an advertisement and can in certain situations, be presented a different product. There is no information on a guarantee and there are also no customer reviews. The way to order this product is deceptive and we overall think there are better and more honest products out there for you and your cognitive needs. 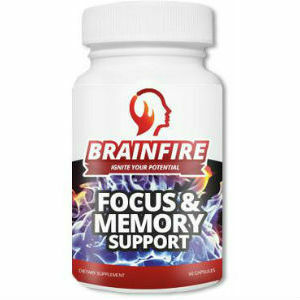 Henry Costa	reviewed Brain Fire Focus and Memory Support	on November 20th	 and gave it a rating of 2.5.